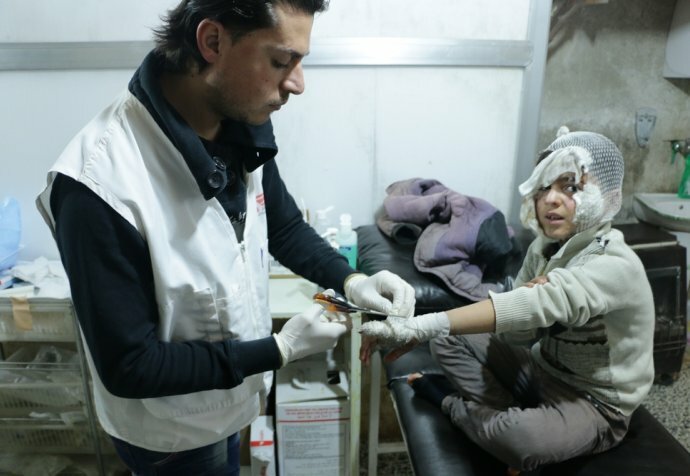 Jessica Vanderwal is an Australian Registered Nurse who recently returned from her first field assignment with Médecins Sans Frontières (MSF), in northern Syria. Allah yerhamu - “God have mercy on him” – is one of the first lines of Arabic I needed to learn after arriving to Tal Abyad Hospital in northern Syria. They are the only words of comfort to offer when supporting grieving families, something I have had to do all too often here. I had wanted to work for Médecins Sans Frontières (MSF) for the entirety of my adult and working life. Now, to work within this amazing team of people I am so grateful to have finally made it. But it isn't all refugee camps, vaccinations and smiling children, the iconic images that spring to mind when you think of MSF. When they offered me a position in a team in north Syria, for my first assignment, I thought there must have been a mistake. But MSF needed someone with recent emergency and trauma nursing experience, so here I am. "It is the Syrian people, the patients and their families that I encounter each day in Tal Abyad Hospital who should feel entitled to complain and yet they don't"
I can’t help but remember how I used to complain about work and life in general on a daily basis at home. Now, I don't think I'll ever feel entitled to complain again. It is the Syrian people, the patients and their families that I encounter each day in Tal Abyad Hospital who should feel entitled to complain and yet they don't. A typical bad shift at my hospital at home sees me on my feet for eight hours straight with no time to have a drink or grab a coffee, let alone go to the bathroom. I'll struggle to find space to fit the next "priority 2" patient with chest pain. I'll have to wait an hour for a CT scan or to get a full list of laboratory results. We are constantly pressured and frantic, harassed to deliver care to the highest standard we can, to care for the patients and their families, while juggling admissions and discharges and meeting deadlines for patient waiting times. But also at home, I have never found myself with a shortage of medical equipment or drug supply and I’m always surrounded by a huge, well trained, specialised medical team that rotate around the clock, so at the end of my shift, there are fresh faces to handover my patients to. Of course at home, we have bad days and we lose patients but however sad and unexpected these circumstances are, I know that we did everything we could do to have helped them survive. I've never had to tell someone that their child died because an explosive device was hidden in a teddy bear, or that their wife died due to a completely treatable non-communicable disease. "The misery that lines the faces of these kind, generous and usually happy people isn’t confined to the horrific consequences of bullets and mine explosions"
Leading up to leaving for my mission in north Syria, I was drawn to the news about the war, the images of airstrikes, and all the political and armed groups struggling for power while the international community looked on and seemingly was unable to do anything. There was seldom information shared about internally displaced people or civilian casualties of war. The news failed to paint me an image of the suffering that people here are enduring. Still, perhaps it is something that you can never really grasp until you face it for yourself. While trauma cases are an everyday reality in the Tal Abyad hospital, the misery that lines the faces of these kind, generous and usually happy people isn’t confined to the horrific consequences of bullets and mine explosions. For the people who have fled from immediate danger, their concerns are now where to sleep, what to eat and how to simply survive another day. Sometimes they have lost limbs and loved ones, and they have nothing but the clothes on their back and yet, they are grateful. They tell me they are the lucky ones, because they are alive. So now my days are filled with stories of true woe, not woe-is-me my child has a button stuck up its nose, but woe-is-me, my husband was shot for no good reason. The bad days here are filled with unimaginable waves of patients with devastating injuries and sickness. A good day here sees a child brought in to us who still has a living parent by their side to soothe them; and the shrapnel that has littered their tiny body hasn't caused any major internal bleeding. Or when the patient we refer survives the three-hour 'ambulance' ride without oxygen to a facility that may or may not have an ICU bed available. A good day sees a shepherd boy miraculously survive after having both of his arms blown off. A big difference compared to my good days at work in Australia. "A good day here sees a child brought in to us who still has a living parent by their side to soothe them; and the shrapnel that has littered their tiny body hasn't caused any major internal bleeding"
I never expected to be in northern Syria, but this is where I find myself. MSF has enabled me to do what I can for the terrible circumstances that people face every day. Some days, it doesn't feel like it is enough, but we persist. We have a huge team here that is working around the clock, week long. Some days are beyond exhausting. We share in our sadness on the tough days, but we also share the successes and the happy moments – watching families reunite, seeing the patients survive devastating traumas and eventually being discharged, able to move on to the next stage of their recovery. Now that the offensive for Raqqa is finished, people are slowly returning to their piles of rubble previously known as home, but booby traps, explosive devices and explosive remnants of war await them. A version of this story first appeared in Nursing Review Magazine.